Depending On Where You Stand In The Americas, My Passion May Be Under Your Feet — The People's Paper & Make A Scene! I have a hard-to-contain passion. I look at places in the Americas and consider what’s under my feet, under the dirt or in a nearby cave or rock shelter from a very, very long time ago. It’s arresting, expanding my thoughts as a firework burst. My interest is before the last great ice age glaciation. In the Cook Inlet area what might have been under our feet is lost. About a mile-high sheet of ice for thousands of years lay on the land in southcentral Alaska during the ice age. We don’t find evidence of pre-ice age hearths or stones fashioned to kill animals for food or other uses in this place. Lack of evidence, however, doesn’t mean evidence of lack. Despite the lack of evidence, people might have lived in the Cook Inlet area before the ice age. If another ice age began and the ice sheets reached the scale of the last ice age, a moving ice sheet a mile high would turn what’s here to dust. There’d likely be nothing left to evidence the passage of humans through this land. When the mile-high ice sheet over southcentral Alaska left, the ground was depressed from thousands of years of incredible glacial weight. As the glaciers began to recede up the ancient rivers from the Chugach, Talkeetna and Alaska Range watershed, the sea seeped back in because the ground was lower than the sea. Freshwater was replaced with saltwater; narrow river channels became the wide Cook Inlet. Saltwater reached Kasilof by 16,000 years ago and Anchorage about 13,000 years ago. The ice would have disintegrated, buried in moraines or carried off any life artifacts. Where people likely lived would be buried underwater. Were people in Cook Inlet before the ice age? Maybe. First: In the area of the Valsequillo reservoir in Mexico, Juan Armento Comacho found a mammoth pelvis bone in 1959. When he later washed it off, he discovered to his surprise it was carved. Someone carved a gomphothere (four-tusked elephant) into the bone when it was green (fresh)! Gomphotheres were extinct. There were other carvings including a speared cat. The find was thought to date back to 30,000 years ago when gomphotheres were thought to have gone extinct. The Smithsonian featured it. Life Magazine did an article about it. And then they tried to date it. Carbon dating didn’t work. Using the uranium series, the bone dated to about 250,000 years ago! A skull fragment had been found decades earlier, near the mammoth pelvis bone. A diplomat to Mexico from Germany carried the skull fragment to Germany, and it ended up in the museum at Leipzig. Someone did a scraping from the skull where diatoms (single-celled aquatic organisms) had adhered to the bone. The skull, known as the Durenberg skull, was destroyed by bombing in WWII. A few decades ago Sam L. VanLandingham examined the diatoms from the Durenberg skull scraping at the California Academy of Sciences in San Francisco. He dated the diatoms inside the skull to between 80,000 to 220,000 years ago! The skull and the carver could actually have been contemporaneous. A stretch, but possible. What happened at Valsequillo? Obviously someone carved a gomphothere and other animals into a green mammoth pelvis bone some 250,000 years ago. A human in the area died and sometime later water backfilled the area, leaving diatoms stuck to the skull. The diatoms could be dated. Second: When we think of cave art, the first thought of most people who know anything about it, is the cave art in Lascaux, France. We have some equally amazing cave art here in the Americas. It’s vivid, arresting, reflecting dynamic life with significance in the middle of nowhere, surrounded by sticker bushes in Brazil. These sticker bushes may have been a secret to the site’s preservation. The site is Toca do Boqueirão da Pedra Furada, Parque Nacional Serra da Capivara. Niede Guidon is the site expert. She dates the art to somewhere before 30,000 years ago. Free Gift For You: I wish all of you happy holidays. 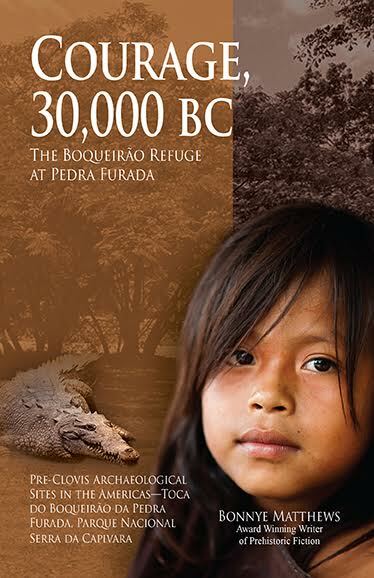 I have a gift for you to share my passion for this subject, an e-book copy of the first novella in the Archaeological Sites series, Freedom, 250,000 BC: Out From the Shadow of Popocatépetl. The focal point of the novella is the Valsequillo site. Go to this link https://ganxy.com/i/116657/bonnye-matthews/freedom-250-000-bc?voucher=dys-zal-piq-lew to download the free e-book. While at the link, there’s a reading from the first chapter of the novella to give you a taste of how the story goes. I’d love to hear your responses to Freedom, 250,000 BC. Feel free to contact me on my website at http://booksbybonnye.com/contact.